Your Solution Here! - LemmTech Enterprises, Inc.
Do you have a unique small or medium sized business? Have you been struggling trying to make the square peg of your business find into the round hole of someone else's software program? 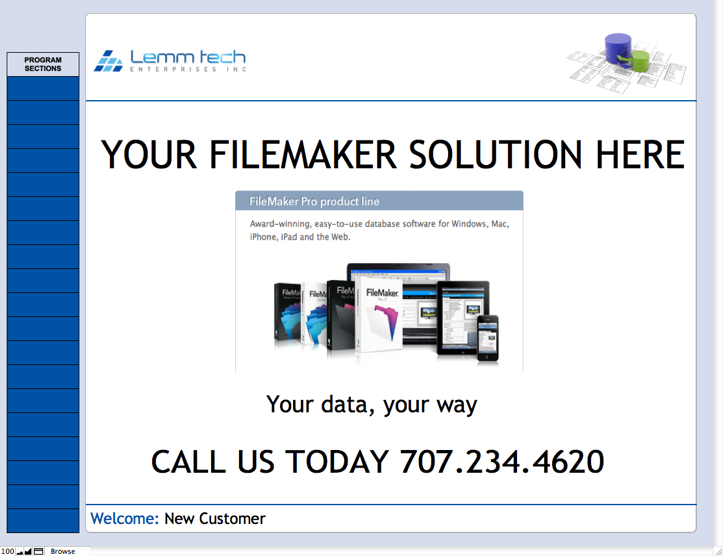 Contact us and realize the power of using the leading Workplace Innovation Platform of FileMaker. Using the FileMaker "platform" you get a complete a suite of technology from front end (desktop) to backend (servers) and everywhere in between (mobile and web) that allows your company to stay on top of managing complex information. The FileMaker platform's suite of technology combined with a trusted professional developer can help you manage your information in ways that will transform your business. Contact us today!